The main political activity described by narrators is the work by the union to improve conditions - safety, health and pay - in the mining industry. There is some talk of the activities of Sendero Luminoso (Shining Path), and of increased military presence in the area - ostensibly to protect local people from the Senderista (followers of Sendero Luminoso), but several narrators suspect the military were there more to protect the mining companies from union activity and protest. There are detailed accounts of how some narrators' experiences in the mines gradually politicised them and of their struggles to gain improvements. One man tells a revealing story about how his application to work in the mines was at first rejected, because of his education: "I gave my papers to the company. I passed the medical exam and after I passed it, they observed me and they didn't want to take me. In reality they didn't want to hire workers who had studies, who had a secondary education, for example...[they said] the people who had more education were the biggest complainers, they were the strikers" (Peru 18). He eventually gained a job and says that, after nationalisation, there was a slight improvement in the companies' attitudes to miners' rights. But the level of accident, injury and inadequate safeguards or compensation motivated him to join the union - an act which, he says, changed and "enriched" his life: "Due to that activity I began to get to know not only about the issues of the miners in my camp but also about those in other camps." Several women describe their increasing involvement in union activity too, for example, setting up community kitchens during strikes - but also taking a more pro-active role: ".we began to co-ordinate with the idea of forming a steering committee for all the mining women in Centromín. We did this because all the leaders began to receive threats, there were disappearances and murders. That was both from Sendero Luminoso and the paramilitaries. That's when the Centromín-wide organisation was founded, when they began to kill the compañeros from Cerro de Pasco and they killed a leader from Morococha called Cajachahua. 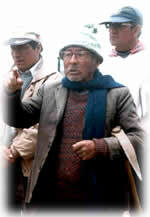 That's when we began to organise around self-defence and human rights" (Peru 24). Since 1992, the unions have lost power. Miners have become worried about losing their jobs; the increase in short-term contracts has added to their insecurity. Many narrators spoke sadly of how the carefully nurtured solidarity among the workers has gradually been eroded: "Things have changed. The workers themselves don't risk it anymore, they don't strike like they did when my father was a union leader because, since 1992, there are no permanent fixed contracts [established]. The laws are very tough and unfavourable to the workers [now]." (Peru 17). Ana, a 39-year-old leader of women's mining association (Peru 24), says union leadership has been undermined too: "Most of the trade union sections have lost their leaders, the ones who were delegates of the different sections. They mainly got rid of the ones the government thinks are troublemakers." "When I started working for the company, I was assigned to clean and maintain the Analysis Laboratory. I did not like the injustices I saw, I didn't like the indifference of the bosses towards the workers. And I would tell my colleagues that it was not right for us to work in contaminated areas in inhuman conditions, with noise that exceeded the permissible limits, toxic gases which would remain in the room in the lab because of the lack of a ventilation system. As a result of my work, I was elected Sectional Delegate by my colleagues. First we negotiated to improve environmental conditions at work and in the city of La Oroya." "You know I didn't want to be a leader, I've never liked being up there at the forefront of all the work. My dad tried to talk to me about it, I didn't like it and I thought differently from him. I only began to like it when we all felt the same way in all the settlements, when there was so much injustice, when the leaders were arrested, and [my husband] Alfredo was a [union] leader! I began to think about things, it was almost to be able to go along with him, then little by little I began to like it. So I already had my own meetings on organisation and little by little I began to like it." "There's no trade union any more, there are no sports championships for miners, there are no more mining songs. You could say that the trade union has lost about 55 - 60% of its social value and as a result it can hardly do anything any more." ".with time people began to get organised and they built up a good trade union. They made better decisions and became more aware of their rights. They organised around their own needs, began to use some pressure and make demands and so they got some benefits through the bargaining agreements. They got milk, clothing, overalls, footwear and housing .but with considerable struggle and a lot of strikes, it was a very strong organisation." "One of the changes I have found is that people now conform easily, they conform more than before. They don't care now, there's a lack of solidarity. It wasn't like that before, it's an important change. The only thing people are interested in is being able to work, that's all. They don't care if someone gets sacked or if something happens to somebody else. I think it was really different before. The unions are too far from what they were before, that has also happened. Well, the prospects [for miners] are dark. There's no longer stability, people know they can be sacked at any moment, you can be expelled and nobody will demand anything, not even [for] himself."